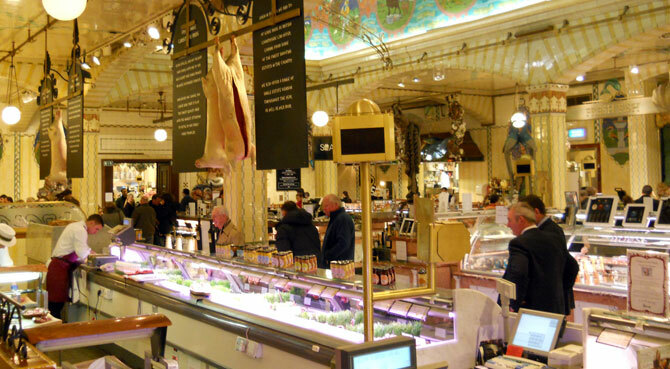 The food court at Harrod's (ablve) is a must see for any London visitor. This is just one of the rooms at the food court. There are a half dozen different courts. You can buy meat, fish, fruit, vegetables, tea or pastry and sit down to enjoy breakfast, lunch or a snack. It is overwhelming in a very good way, but pricey as everything is "the best available". No matter what anyone tells you, size does matter. Women shoppers should add two (2) to their size when in Britain. If they wear a size 10 dress in America, they will wear a size 12 in Britain and Europe. For many that fact alone is reason enough to avoid shopping altogether. Shoes, on the other hand, go in the other direction. A size 12 American foot is a size 10 in England. Men shoppers have a much easier time. Suits and shirts are the same on both sides of the pond. Shoes, however are a different story. If you wear a size 12 in America, you wear an 11 in England. www.21stCenturyVillage.com - the illustrated online guide to specialist shops and businesses in London and Amsterdam. Our sites represent fashion boutiques, designers, designer accessories, beauty specialists, interior design & furniture, art galleries, garden design and other specialist businesses. Street Sensations - Entire streetscapes showing over 3000 shops, bars and restaurants in the liveliest areas of London - Oxford Street and Regent Street; Portobello Road and Notting Hill; the King's Road in Chelsea; Carnaby Street; Covent Garden, Bond Street; Knightsbridge; Soho and Chinatown; Islington and Camden. You can order a printed version for serious shopping. Charing Cross Road, Leicester Square, Tottenham Court Road tube station is the place to find new, secondhand and antiquarian bookshops clustered together. It's a book lovers mecca. Foyles is London's largest and is notorious for its disorganization. Monday-Saturday 9 am to 6 pm, Thursday 9 am to 7 pm. 119-125 Charing Cross Road, (T) 437-5660. Waterstones 203 - 206 Piccadilly, W1. Open: Mon - Sat 10am-10pm. Sun 12 - 6pm. Europe's largest bookstore, this is Waterstones flagship store. 14 other London branches including Harrods. Top floor lounge bar overlooking London and good list of book signings and events both here and at Harrods. Online shopping facility. W.H.Smith . You will find a branch ofSmiths in all rail terminals, major London Transport Tube stations and the London airports selling newspapers, magazines and books. Outside London there is a branchin practically every High Street. At larger branchesthey also sellgreeting cards, gifts, videos, DVDs, CDs, computer games and electronics. Online shopping facility. Bicester Outlet Shopping Village is in Oxfordshire, about 90 min. by taxi. You'll find 48 outlet shops with discounts on brands including Jaeger, Kurt Geiger, Aquasculum, Benetton and Jigsaw. 50 Pringle Drive, Bicester, Oxon (T) 01869-373-200. Burberry Discount Outlet. Monday-Friday noon to 6 pm, Saturday 9 am to 3 pm for raincoats and accessories. 29 Chatham Place, Hackney E9, (T) (0181) 985-3344. Grays, world famous. You'll find 250 dealers selling items ranging from bric-a-brac and memorabilia to quality antiques. 25 up. Monday-Friday 10AM - 6PM pm. 1-7 Davies Mews and 58 Davies St., W1, phone (T) 020-7629-7034. Alfie's 350 stands frequented by dealers. Tuesday-Saturday 10 am to 6 pm. 13-25 Church St., off Marylebone, (T) 020-7723-6066. Chelsea Antiques Market A busy market offering clocks, watches, books and collectibles. MON-SAT 10AM - 6PM, 245-253 Kings Rd., Chelsea, (T) 020-7352-5689. There are many street markets in London that are there for the locals to shop at. Others are more suited to tourists looking for collectibles. We have separated our listing of the more well known. High Street, Walthamstow, E17. Thursday Friday and Saturday. Sheperds Bush, W12. MON - SAT, except Thursday afternoons. Whitechapel Market. Whitechapel Road E1. MON - SAT, East End. A long established, local street market right by the Whitechapel underground station that offers everything from fresh fruit to fish, clothing, bedding, carpets, jewellery and electrical goods can be had at bargain prices. Camden Lock Market: Photo of the bridge over the lock is provided courtesy of The Mac Bar , a lounge-bar-gastropub in central Camden tailored with comfy leather sofas, table service, complimentary newspapers, exquisite food and 51 fine cocktails. If you're headed to the Camden Market, stop by. They're located opposite Camden Road Bridge, a two minute walk from the Camden Tube up Camden Road. Open Daily: 12PM-11PM. Sundays 12PM -10:30PM. Borough Market Acclaimed gourmet food retail market open Fridays and Saturdays working alongside London's 250 year old wholesale fruit and vegetable market at London Bridge. This market is a remarkable experience and is undoubtedly Britain's finest gourmet food market, ranking with Europe's best. Camden Markets , including Camden Lock Market , Camden Passage and Camden Town markets, north of Regents Park. Almost everything. A serious happening scene on the weekends. Covent Garden Market , Covent Garden. Daily 9AM - 6:30PM. Collectibles, crafts, jewelry, books. Farringdon Road, EC1. M - F. Old books and manuscripts. Gabriels Wharf , 56 Upper Ground, South Bank SE1. SAT - SUN, Flowers, Vegetables and clothes. Jubilee Market , Jubilee hall, Covent Garden, WC2. Daily. Antiques, crafts and general goods. Kensington Market, Kensington High Street, W8. Monday to Saturday, Clothes and some antiques. Leadenhall Market, Gracechurch street EC3. Monday to Friday, food market in splendid Victorian building. Petticoat Lane, Middlesex Street E1. Sunday mornings, Everything with emphasis on fashions. Portabello Road, W11. Fruit and Vegetables and bric a brac from Monday to Friday, Antiques and collectibles on Saturday. A street theatre scene. Ridley Road, E8. Tues - Sat except Thursday afternoons, East End market with Jewish and West Indian leanings. Kensington High Street, a is a few miles west of Oxford Street. Not quite as busy, it offers a mix of national chain stores, boutiques and shops. Camden Town, just north of central London, is known for imported records, pine furniture and stores that cater to exotic or "different" clothing. Covent Garden , between the West End and the City. A hot spot features street entertainment, all manner of bars, pubs and eateries, craft and modern jewelry shops, boutiques and market stalls. (T) 020-7836-9136. Covent Garden tube stop. Kings Road in Chelsea is great for people watching their boutiques and cafes. The Soho area, just north of Piccadilly Circus, is where you'll find an intoxicating mix of Asian supermarkets and boutique delicatessens, trendy sandwich bars and designer cloths. Saville Row, Mayfair, is still the pinnacle of custom tailoring. The Salvage Shop sells merchandise from bankrupt merchants as well as fire- or flood-damaged goods at discounts of up to 50%. A great place for rummaging. Stocks anything from perfume to clothespins to typewriters, but specializes in furniture. Monday-Saturday 9 am to 5:30 pm. 34-38 Watling Ave., Brent Oak, Edgware HA8 OLR, (T) 020-7952-4353. David Richard & Sons silverware wholesalers. Monday-Thursday 9:30 am to 5:30 pm, Friday 9:30 am to 4 pm. 12 New Cavendish St., Mayfair, (T) 020-7935-3206. Sotheby's, 34-35 New Bond St. W1, (T) 020-7493-8080. R. Twining & Co. 290 years in the tea business. Monday-Friday 9:30 am to 4:30 pm. 216 Strand, WC2R 1AP, (T) 020-7353-3511. Charbonnel & Walker. 120 years selling chocolates and finely made novelty confections. Open Monday-Friday 9 am to 6 pm, Saturday 10 am to 5:30 pm. 1 The Royal Arcade, 28 Old Bond St., (T) 020-7491-0939. Best of British Traditional British crafts. Monday-Saturday 10:30 am to 7 pm, Sunday 1 to 5 pm. 24 Thomas Neal Centre, Earlham Street, (T) 020-7379-4097.